Summary: From the time Ada Byron was a child, she loved the world of science and, especially, math. She designed a flying machine at the age of 12, shortly before becoming very ill with a case of the measles that left her temporarily blind and paralyzed. 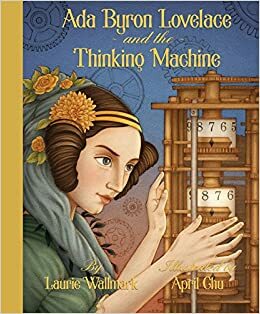 She persevered with her education, however, and when she was 17, she met Charles Babbage, a mathematician and inventor who had created a mechanical calculating machine. He had also designed, but not built, an Analytical Engine, which was a more sophisticated machine, the forerunner of a computer. Ada studied his designs for this machine, and created a numerical algorithm that would instruct it. Although Babbage never built his machine, Ada’s algorithm is considered to be the first computer program. Back matter includes an author’s note, timeline, and bibliography. Pros: An inspiring story of a brilliant girl growing up in a time when such brilliance was not generally recognized and nurtured. Chu’s illustrations evoke the early 19th-century feel of Ada’s time in history. Cons: The pages describing the young Ada’s design of a flying machine, followed by her bout with measles, seemed a little disjointed and confusing to me.